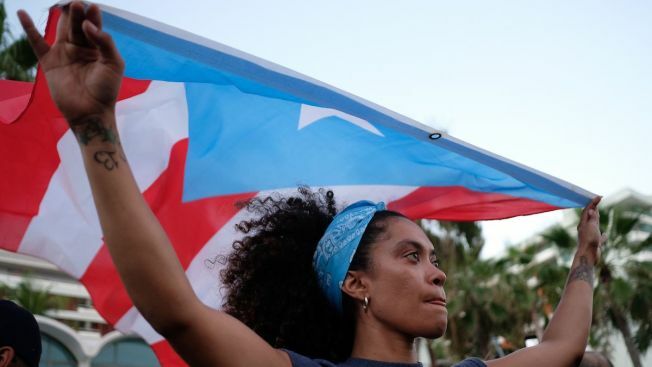 This May 2, 2018, file photo shows a person marching to protest pension cuts, school closures and slow hurricane recovery efforts in the El Condado tourist zone in San Juan, Puerto Rico. Hundreds of Hurricane Maria evacuees from Puerto Rico who are living in hotels around the nation have been given more weeks to use temporary housing vouchers after a federal judge extended a temporary restraining order. U.S. District Judge Timothy Hillman on Thursday ruled they can use the assistance through at least checkout time on Aug. 7. Hillman said he wants to hold another hearing on the evacuees' request to keep the Transitional Sheltering Assistance program going and he expects to issue an order on Aug. 6. The evacuees have been living in hotels on the mainland since they fled the island after Hurricane Maria last September. Evacuees sued the Federal Emergency Management Agency earlier this month, just hours before the housing assistance was supposed to end. Officials with FEMA said in a statement that participating hotels were being notified about the new extension. FEMA is offering to cover the cost of evacuees moving back to island through the end of August. As of Friday, 675 evacuated families were using the vouchers on the mainland and another 375 families were using the vouchers on the island, according to FEMA. Florida had the most evacuated families using the vouchers on the mainland, with 326, followed by Massachusetts with 166 families. In new affidavits filed with the court, Puerto Rican evacuees said they feared losing the housing vouchers. Elizabeth Delgado Santos came to Worcester, Massachusetts last January with her two children to live with her mother but her mother kicked them out after a few weeks and they became homeless. She started using the vouchers last February at a Worcester motel. She said she has felt tremendous fear and anxiety since being told the assistance was ending, because she has no other housing options and no support system. "I would wake up and go to sleep at night with severe stress and anxiety about where I would sleep with my children," she wrote.